The Weider Pro 4300 Home Gym will show you why it is considered the best home gym there is. Nothing quite matches up to the convenience of a home gym. The home gym is quite possibly one of the best pieces of machinery for those looking to get in shape or stay in shape. The home gym can come with a variety of different exercise equipment that will help you build muscle. Many of these home gyms offer you a convenient gym that can be used at any time. This offers a new user the privacy and ease of a gym that is tailored for their needs. To truly appreciate a home gym it would be good to take a look at one of the best on the market. When you are looking for a good home gym there are a few things to look out for. One of the most important aspects of a home gym is it should save you space. A home gym that is too bulky or takes up too much space is a horrible investment. A good home gym will be able to be stored in a room or a garage without taking up a lot of space. Also the equipment should be comfortable enough for you to use. One other aspect of a good home gym would be versatility of workouts. Your home gym should allow you to perform a wide variety of exercise in one convenient machine. Home gyms that only emphasize two muscle groups should not be bought. This will ensure that you can properly train all the large muscle groups of your body effectively. For example your home gym should have a pulley, leg curl or leg press machine, preacher pad and a chest fly option. The Weider Pro 4300 is an awesome investment in your fitness and exercise goals. The Weider Pro 4300 offers you a variety of different exercises that you can perform at home. The home gym is incredibly convenient and can easily be stored in a room or in an empty space in the garage. The Weider Pro 4300 comes with a chest press bar that is perfect for overall pectoral development. You also have an adjustable Lat bar as well as a low row pulley for performing back exercises. Along with the pulleys you have a leg curl machine that is perfect for developing powerful legs. With this world class Home Gym you can perform up to 55 different exercises, meaning you will never get bored with a workout. The industrial strength pulleys allows you to easily go through a wide range of movements, easily and efficiently. The design of the Weider Pro 4300 is built to resist rust and damage, so you can train intensely without working about it breaking down. The weight stack is up to 125 lbs and offers up to 330 lbs of resistances combined. Along with all of the great exercises that can be performed there are other benefits along with this Home Gym. This home gym is perfect for both professionals as well as novices that are looking to improve their physique. The Weider Pro 4300 Home Gym comes with an fully adjustable sewn seat that is extremely comfortable to exercise in. There are ankle straps attached to the leg curl machine so there will be no slipping during a workout. The frame is steel powdered and extremely durable with a warranty of 90 days on all parts and pieces.Along with the home gym there comes a professional workout guide. The workout guide has been created by fitness professionals who want to help you succeed in all of your fitness goals. The personal trainer guidance chart is the perfect reference for you to use during your workout days. This will teach you how to effectively use the machine to optimize your workouts. 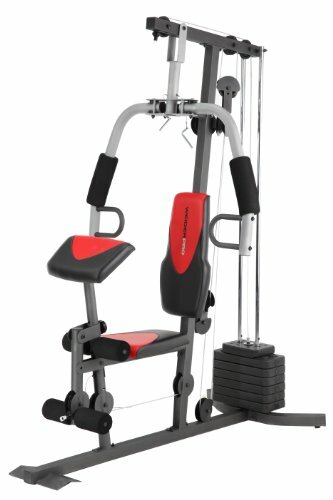 Home gym that is perfect for both advanced as well as novices. Fully adjustable sewn seats that are extremely comfortable. Home gym designed to help you save space and can easily be placed in a room. Ankle straps for added comfortable while performing leg curls. Personal guidance chart with complete workout information and help. Steel powdered frame that is rust resistant. Can perform up to 55 different exercises on this machine.